Joslyn Paige, 28 years old, narrated to the Detroit Free Press how he used to be homeless when he moved to New Orleans a few years back. He was able to get out of it by performing in the streets. A recent video of him donning a Transformer costume has gone viral online and currently clocked over two million views on YouTube and counting. 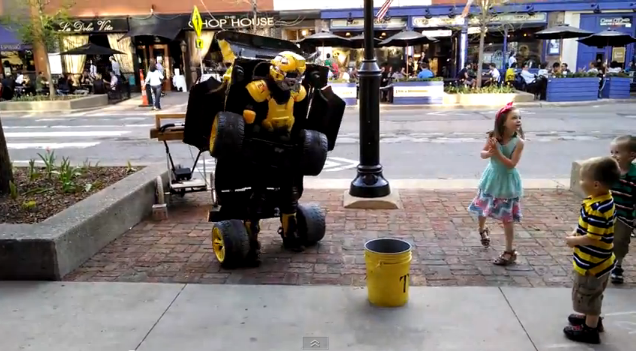 He's seen entertaining children in Ann Arbor, Michigan with his costume which he actually transforms into an almost realistic car and rolls around with it. He uses batteries to move the wheels when he's in car mode. Paige spent about $800 to build the costume and it took him five weeks to finish it. Although he says that he enjoys performing in front of people with the heavy costume, there are a few drawbacks like getting painful knees at the end of the day and getting mugged by some people.